Olive oil naturally flavored with basil. 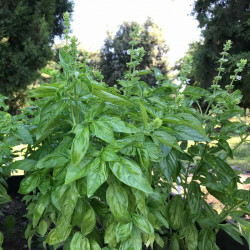 The freshly harvested basil is carefully sorted and then crushed with olive oil for a natural infusion of a few days. After filtration, we obtain a powerful aromatic olive oil that goes wonderfully well with all your Mediterranean dishes.